We, Wageningen 2016, have improved the characterization of BBa_K546000 by testing it with a reporter on a separate plasmid, something not done before. Up to now this parts functioning had only been assessed when combined with another part into one new biobrick (main page). Our characterization also spans a far longer time than previous analyses and shows the dynamics of part BBa_K546000 during bacterial growth. To provide future teams with an easy quorum sensing system that reports activity itself, we created and submitted part BBa_K1913005 to the registry. We tested BBa_K546000 in pSB4K5 with a HSL reporter (BBa_K1913014) in pSB1C3. 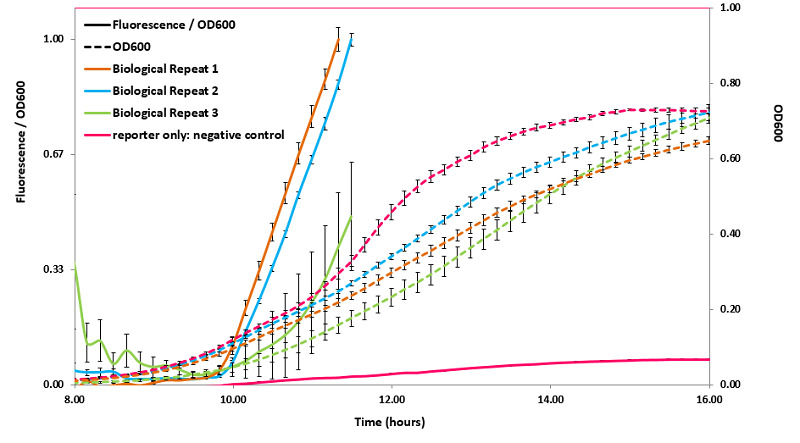 E. coli DH5alpha cells were transformed with both plasmids (cells containing BBa_K546000 were used to make elctrocompetent cells, which were then transformed with the reporter), these cells were tested overnight in BioTek’s SynergyMx plate reader overnight (figure 1, figure 2). Figure 1. Fluorescence (excitation: 480nm, emission 510nm, bandwidth: 9nm) and absorbance data for E. coli quorum sensing strains. Error bars indicate standard error of the mean. Continuous line: Fluorescence/OD600; Dashed line: Absorbance at 600nm. Orange, Blue: separate biological repeats of the DH5alpha strains containing the 2 plasmids (BBa_K546000 in pSB4K5 and BBa_K1913014 in pSB1C3). Pink: reporter plasmid only strain. For both strains every value displayed is the average of all (4) technical replicates. All Fluorescence/OD600 data were normalized to the highest Fluorescence/OD600 value measured. After almost 12 hours, the fluorescence from the 2 plasmid strains reached an overflow. Therefore no values after this point are displayed. One biological repeat of the 2 plasmid strain experiment is not shown to improve the clarity of the graph. For completeness, the complete graph is shown underneath here. Figure 2. Fluorescence and absorbance data for E. coli quorum sensing strains. Error bars indicate standard error of the mean. Continuous line: Fluorescence/OD600; Dashed line: Absorbance at OD600. Orange, Blue, Green: separate biological repeats of the DH5alpha strains containing the 2 plasmids (BBa_K546000 in pSB4K5 and BBa_K1913014 in pSB1C3). Pink: reporter plasmid only strain. For both strains every value displayed is the average of all (4) technical replicates. 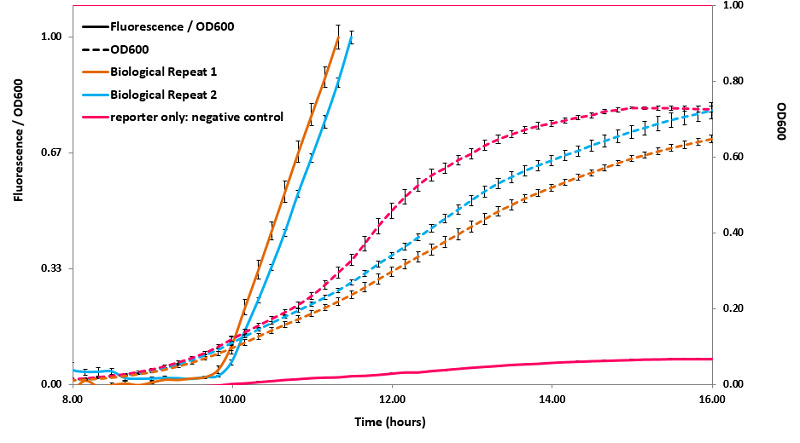 All Fluorescence/OD600 data were normalized to the highest Fluorescence/OD600 value measured. After almost 12 hours, the fluorescence from the 2 plasmid strains reached an overflow. Therefore no values after this point are displayed. One biological repeat (green) showed a high variance between technical repeats in both OD600 and Fluorescence/OD600 values. These data show that BBa_K546000 functions as expected. When HSL levels are visualized with GFP activity, we see that when cell density (here measured as OD600) increases, there is a sharp increase in HSL concentration in the cells. Though a slight increase in fluorescence is also seen in the absence of the quorum sensing genes from BBa_K546000, this increase does not compare to the increase seen in the presence of the lux quorum sensing system. We therefore highly recommend the use of BBa_K546000, possibly in conjunction with reporter BBa_K1913014. In an attempt to streamline the use of these parts for future team, we created BBa_K1913005, a composite part that includes both BBa_K546000 and BBa_K1913014.